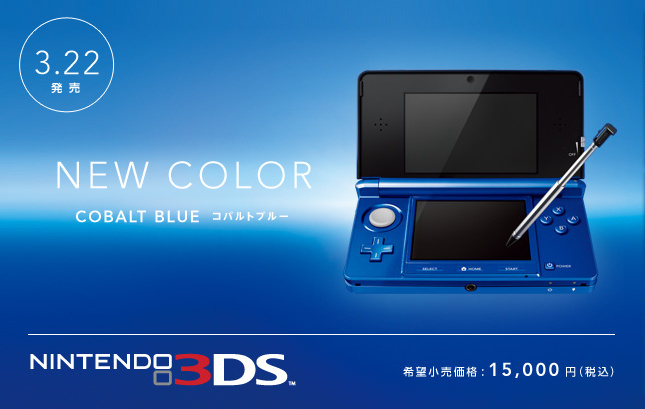 Nintendo of Japan just pulled the sheet off its newest 3DS colour: Cobalt Blue. The darker blue — which you may remember from a DS Lite that hit Japan and North America — is scheduled to go on sale across the country from 22nd March, the same day Kid Icarus: Uprising goes on sale. Even more beautiful is the special edition Fire Emblem: Kakusei console, due on 19th April for ¥19,800 — about £153 / $244 / €183. The system comes with the game and also a ¥1,000 eShop card, presumably to spend on Fire Emblem DLC. Damn I loved my cobalt ds lite, but I am a prisoner of Aqua Blue!!! NOOOOOOOOOOO!! The color is certainly aesthetically pleasing. I'm satisfied with my red one. Well, almost. I wish it would have a better grip like my DSiXL. I love this color but I really want that Fire Emblem Cobalt Blue that Japan is getting. It is beautiful! EDIT: Since James just added the image, I can remove my link now. How many 3DS in better then original colors do you intend to sell Nintendo before releasing 3DS Lite in bad colors only to sell them in better colors again later? I want my built in Circle Pad Pro! Also, dedicated screen shot button. Do want. Really nice color to be honest, I usually only go with White/Black when it comes to consoles. But I could definitely see myself buying that. To bad I already have a black unit. Hopefully they'll make a 3DS Pro or something soon. Love this color! Hopefully we get it here! Wow, I didn't even notice the special edition FE system when I first looked at the article. Now that's a beautiful console. If only I was rich, I'd have like 5 different 3DS special edition systems by now lol. @PickledJimmy Eeyup, I'm with mine too! NOOOOOOOOOOO!!! although i am suprised there hasn`t been a pikachu yellow 3DS yet. but i suppose there`s still plenty of time yet. just had a thought, in the year so far that 3DS has been out, exactly how many colours are there now, including special editions? about 14 that i can think of adding in the two from this article. black, white, two blues, pink, red, zelda special, gundam special, fire emblam special, metal gear solid special, dragon quest special, plus the 3 club nintendo editions, mario, peach, and toad. what is annoying is that most of the special editions will never see release outside of japan. why couldn't we have had this at launch instead of the other 'blue' which was actually teal? I think this color could be coming to America in September based on what nintendo has already done. The red 3ds was released in march 2011(I think, correct me if I'm wrong) in japan, which came to the states in September. So I'm just guessing the blue one might come at the same time too. If it doesn't , then it will most likely be released as a holiday bundle. Why did I get BLACK, the most boring of colors?! Of course they release the console in my favorite color AFTER the system launch. Now the 3DS is in my two favorite colors and I'm stuck with Aqua Blue because I'm not buying another 3DS until this one is broken. Which is probably likely as I've already had to send it in for a repair. They replaced the clicky L and R buttons with more DSlite like soft buttons but I need to replace the screen protector that I put on because the system was scratching itself again when I asked them to fix that too because the screen protector has two really distracting lines again. Now this is the blue I was excpecting to see from the beginning, not that fugly sea green colored monstrosity. I wouldn't have gotten it anyway, because the black one (and later on, the Zelda one) is still my top pick, but this is what should have been available from launch. I'm fine with my Aqua blue 3DS but this does look very nice. It's a shame that won't be released outside of Japan, and I won't be buying a new 3DS unless something happens to mine anyway. Man that looks awesome, if they ever do make another iteration of the 3ds with two circle pads and extra buttons, I hope they will release it in a variety of cool colors. NOOOOOOOOOOOOOOOOO!!! I alredy own a Aqua blue! That's a sweet blue. Much better than that Aqua Blue shiz. But I shall not sway from black! It looks OK. But with the Fire Emblem flair, it looks way better (although I would prefer it to be red). hope nintendo of europe and america take note and release that cobalt blue 3DS edition. i love the dragon print on it as well. I love it! I never got the aqua blue because it was too light imo. But this might get me to trade in my Cosmo Black. @YashaTheSlayer This! Yes, you speak the truth! No offense to anyone, I don't mean to offend, but that launch color--Aqua Blue or whatever it's called--really isn't the shade of blue I like, at all. This Cobalt Blue is much more appealing to me, and I wish that was the kind of blue at launch. Just wondering, did the ambassador 3DS come in aqua blue and black, or had the red 3DS come out yet? ohh, very nice!!! I love the deep (but not too deep) blue. I have the red console though and just picked it up. My favourite colour is red I guess that's one way Nintendo gets people to buy, they like to sell there portables in different colours. I was totally fine with my black one until I saw this! I agree, this is the blue that should have been released at launch! I'll take red over this any day.But this looks way better than the Sea Green color available at launch.I have a 49red 3DS btw. Wish that was available over the holiday season. Stuck with aqua blue... better than nothing but eh what a bummer. Too bad I already have one. Mine's Fire Red. I don't know if I would have bought Cobalt Blue anyway, though, because it has a Fire Emblem logo on it. I have the Midnight Blue DSi, and my brother has the Midnight Blue DSi XL.